Excessive testing takes time away from learning. 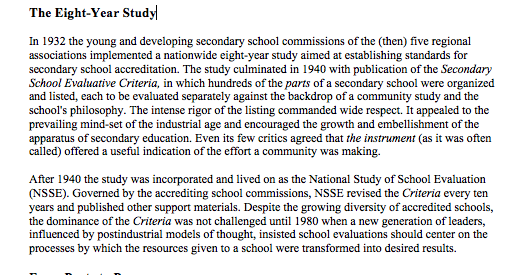 Assessing our schools has a long history of research behind it. The Cooperative Study of Secondary School Standards laid out in great detail their methodology and the tools they used to evaluate the quality of schools. They concluded there are six elements within the school that should be used to judge quality of the learning experience: 1) Curriculum, 2) Pupil activities, 3) Library, 4) Guidance, 5) Instruction, and 6) Outcomes. 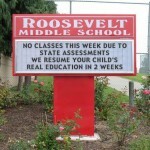 how to stimulate schools to continue to strive to become better. The process is nothing new and it is being taught in some public institutions. An accreditation certification program at the University of California, Riverside (UCR) Extension System is one example. If you take a moment to glance through the list of topics covered, you’ll find it includes a multitude of ways to assess quality on everything from disaggregation of student data to analyzing community profiles. To sustain an improvement process takes knowledgeable leadership. If we were serious about improving our public schools, we would quit handing over leadership training to private non-profits like the Broad Foundation’s Leadership Academy or Marc Tucker‘s “National” Institute for School Leadership. We would set standards for leadership training that included the best practices of school improvement processes. We would put quality control back in the public realm. We have no idea what these private philanthropic endeavors are teaching, but the country’s education system certainly is suffering under their leadership especially in the large urban school districts that they have taken over (last full paragraph is telling). So to meet students’ needs a school improvement process must begin with a “needs assessment.” Various survey tools exist. We don’t need to reinvent any wheels to move forward. 5) The use of measures of pupil achievement as the basis for program evaluation. Approximately 30 more years passed and we now have Robert Marzano’s indicator framework developed around the Effective Schools Correlates with a bit more of a standards-aligned (standards-referenced) twist to the indicator system. The system is arranged in “levels” but should be worked on simultaneously. If you glance through the system of indicators, you’ll find that many of the “assessments” are simple low-cost surveys. 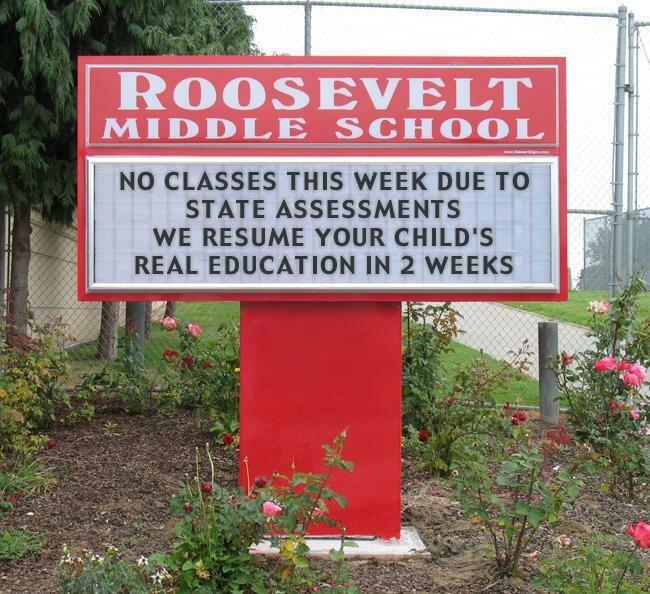 But keep in mind; school evaluations need to be tailored to the schools needs. No one-size –fits-all mandate will suffice. “Stakeholder” participation in planning makes success more likely. And as we know, schools don’t improve and then just stay that way. Students, parents, teachers, and leaders come and go; things change. Schools must see improvement as a continuous process, always striving to be better. But, we do need oversight. So another “accountability” piece, that goes by various names (Quality Review, Inspection, Success, or Support Teams), is teams of “outside” evaluators. The long-standing recommendation is that a visit every five years is sufficient. If schools are having difficulties, more frequent visits are recommended. These review teams could be established within state’s departments of education (once leaders are trained in sufficient numbers). State inspections could encompass such things as assessment of the curriculum assuring that it is broad and engaging, appraisal of teachers’ continuing education ensuring quality and sufficient learning opportunities are being offered, evaluation of the level of parental and family engagement opportunities and communications, and that there is satisfactory evidence that the school is conscientiously working towards improving rather than just complying with paperwork. Evaluations by a Quality Review Team every 5 years or 1-2 years if needed. We have ignored establishing opportunity-to-learn standards but I believe they are incorporated into a school accountability system such as what is described here. Currently, there are multiple versions of these ideas. I have read at least eight “new” plans from eight different organizations. Terminology varies but the major ideas remain the same. What we do know with certainty is…. This entry was posted in American Education Wars, Education Policy, Education Reform, My Advice, School Improvement Process and tagged accountability, Broad Center, Broad Foundation, Broad Leadership Academy, continuous school improvement, correlates for effective schools, effective schools, Federation for Community Schools, Federation of Community Schools, Joseph Bishop, Marc Tucker, National Institute for School Leadership, opportunity to learn, Robert Marzano, UCR Extention, Wendy Schwartz by Victoria M. Young. Bookmark the permalink.